The many jubilant children, parents, and caretakers who attended Fort Greene Park's weekly Kids Concert on June 29th were treated to the musical stylings of one of Brooklyn's most popular children's artists, Mil's Trills. Over 500 people filled into the grove of London Planes by the Monument Plaza, creating a palpable energy that permeated through all who were present and only increased as the performance went on. As the folky tunes of Mil's Trills resonated across the grove, the children could not help but clap, jump, dance, and run around. Even the adults were affected by the infectious tunes, and more than a couple of them carried slight smiles and bodies that gently swayed to the beat. The band's leader, Amelia Robinson, encouraged plenty of interaction between herself and the audience members, leading to a comfortable involved experience. Once the Kid's Concert concluded, many of the concertgoers migrated to the southwest wing of the Monument Plaza to participate in an interactive Mini Mosaic event. The activity, organized by the Fort Greene Park Conservancy in collaboration with neighborhood artist and UrbanGlass instructor Amanda Patenaude, offered community members the opportunity to participate in workshops to help transform the many pounds of broken glass collected by Fort Greene Park workers and volunteers into pieces of art they could take home. 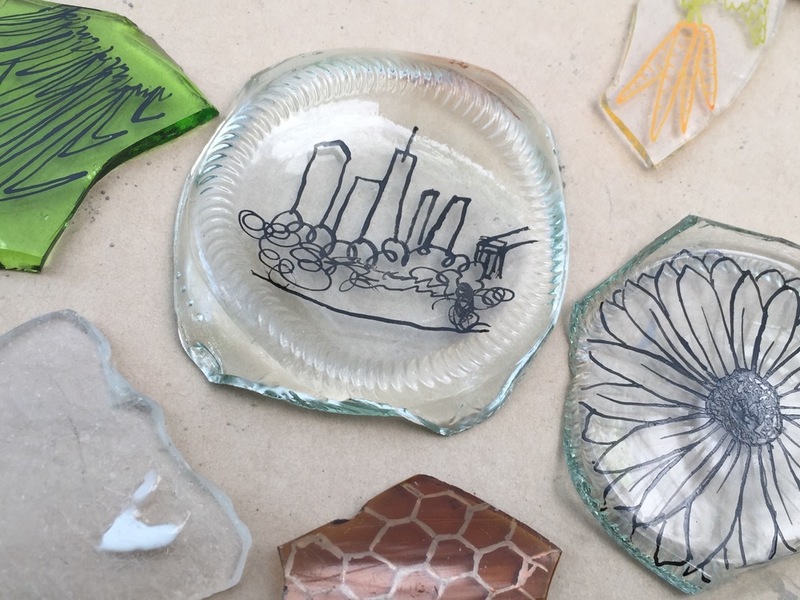 The concept for the event merged from the Fort Greene Park Director David Barker and FGPC's desire to engage the community and raise awareness towards the problem of historic glass litter in the park. Under Barker's direction, the glass shards, dating back as far as the 1930's, have been removed from the park for the past year and a half, and continue to be uncovered in heavily eroded and compacted areas. Fortunately, the park does not have a current problem with glass littering and FGPC is working to recycle and reuse these historic pieces of glass. The mosaic activities are just one of the ways park goers and community members can help tackle this glass issue. As a crowd of children eagerly gathered around the tables stocked with tools and supplies for the participants, Amanda enthusiastically explained the activity. Each person selected their favorite glass fragments, with colors ranging from green to blue to red, and glued the fragments onto a wooden block in a pattern of their choosing. Participants used grout to fill the empty spaces and evened out the surface with a paintbrush. The children, proudly holding their finished crafts, left with huge grins on their faces, pleased with the work they had done and excited for future art events. During the Fort Greene Park Greenmarket the following week on July 9th, enthusiastic children and adults from the community were again given the opportunity to make their own mosaic tiles with Amanda. Looks of awe and amazement spread across the faces under the FGPC tent when they were all told about the origins of the glass they would be taking home. Community members drew and submitted ideas to be translated into mosaic pieces with the knowledge that they were contributing in efforts to beautify their neighborhood, inspiring a feeling pf community amongst neighbors. These two workshops allowed neighbors to come together to transform waste into phenomenal pieces of art. Using fun and creativity to tackle community problems is one way in which we can appreciate out urban green spaces and aid efforts to conserve them. Check our website, sign up for our newsletter, or visit our Facebook page for updates on possible workshops in the future, as well as other FGPC events. Suggestions for projects are always welcome, so please email us at info@fortgreenepark.org with ideas and thoughts. Volunteer help is also always in need; email us at volunteer@fortgreenepark.org to sign up to volunteer in Fort Greene Park. Kid's Concert: Music in the Grove is funded by a generous multi-year grant from The Butler Family Foundation. The Glass Mosaic events were funded with support from the National Environmental Education Foundation, as well as Toyota Motor Sales USA, Inc.